Parfums Caron was founded in Paris in 1904 by Ernest Daltroff. Daltroff was a self-taught perfumer, and was responsible for the house's early fragrance releases. His partner and muse was Félicie Wanpouille, who took over the fragrance packaging and, after Daltroff's death, the management of the company. Daltroff fled Paris for the United States in 1939 and died two years later. Daltroff's assistant Michel Morsetti continued to create new fragrances for the line, some of them based on formulas left in Daltroff's notes. Narcisse Noir (1911) was Daltroff's first big success, and is the earliest of his creations that is still made today. Other well known Caron fragrances include Tabac Blond (1919), Nuit de Noel (1922), Bellodgia (1927), En Avion (1929), Fleurs de Rocaille (1933), Pour Un Homme (1934), Alpona (1939), Farnesiana (1947) and Muguet du Bonheur (1952). In 1988, Parfums Caron was purchased by the Alès Group. In 2018, it was sold to Luxembourg-based Cattleya Finance. Modern creations include Yatagan (1976), Nocturnes (1981), Le 3ème Homme de Caron (1985), Parfum Sacre (1990), Fleur de Rocaille (1993), Aimez Moi (1996), L'Anarchiste (2000), Lady Caron (2000), Tubereuse (2003), Miss Rocaille (2004), Impact Pour Homme (2005). Recent releases include Eau de Reglisse (2006), Montaigne (2007, reissue of a 1986 scent), Les plus Belles Lavandes de Caron (2008), Parfum Sacre Intense (2010), Secret Oud & Oud (2010), Yuzu Man (2011), Délire de Roses (2011), L'Accord Code 119 (2012), My Ylang & Più Bellodgia (2013), L'Eau Cologne & L'Eau Pure (2014), Pour Un Homme Sport (2015), Pour Un Homme Parfum (2017). At major department stores or at the online fragrance discounters. 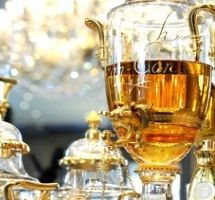 The "urn fragrances", so called because the parfum is kept in an urn which is used to fill the bottle chosen by the customer (see image above), must be purchased at one of the the Caron boutiques. There is a list of locations on the website, or see a report on the New York boutique. See all articles on Now Smell this tagged Caron. See also: review of the book Caron by Jean-Marie Martin-Hattemberg.